As promised I will go on with my new Jalopnik-section talking about the most beautiful concept cars built by General Motors a long time ago. Today we want to look at some cool stuff based on the 1st Gen-Corvette. Ladies and Gentlemen – the Corvette Station Wagon. In case you missed my first concept car article from days ago, check it out here, especially you, Chevy guys: Long live the El Camino! For all the others I today want to share some cool prototype versions based on the very-first generation of the Corvette. As early as just one year after the introduction and sale of the first 300 Corvettes General Motors showed more creativity in presenting three more body styles based on the little Roadster. It was GM's own Motorama Show of 1954 in New York were the public was able to discover the Corvette Corvair (a fastback version), the Corvette Coupe and last not least the Corvette Nomad (a station wagon). Especially the latter received overwhelming reactions, with its just-two doors it looked like the perfect car for the sporty dad. 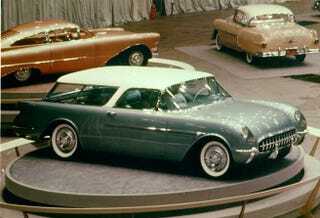 Five of these experimental station wagons were built for the shows, three are still known to exist. Because of all the impressed show visitors General Motors decided to build a station wagon with two doors just one year later as a production model, but based on a larger platform. About six years later the Corvair moniker appeared again as well – as a compact car with rear engine as you all know. In business life Bjoern Marek enjoys life as the Head of Public Relations of ABT Sportsline, the worlds largest tuning company when it comes to cars from VW and Audi, sold in more than 50 countries worldwide. In his spare time he loves to drive some of his old american classics like a 1995 Dodge Viper or 1949 Studebaker in southern Germany. My Life in Florida - Cars, Lifestyle, Vlogs!